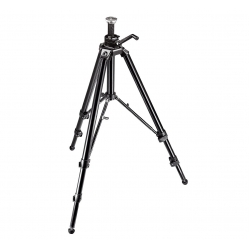 All aluminium construction and unrivalled in stability, the 475B Pro Geared Tripod incorporates a unique centre brace structure system, reliable quick-action leg locks, non-rollback three fac ted centre column, spirit level and rubber/metal spiked feet. The revolutionary centre brace system can be operated in a symmetric or asymmetric way. This allows you to achieve two important results: fast positioning by locking the braces so that all of the legs willspread to the same angle and open instantly, or individual setting of the angle of each leg for the ultimate in tripod flexibility. To avoid annoying delays in levelling the tripod, the telescopic centre braces have been designed with two 'click stop' positions that allow you to easily find the same spread angle on all three legs. The second improvement has been made to the leg locking system.